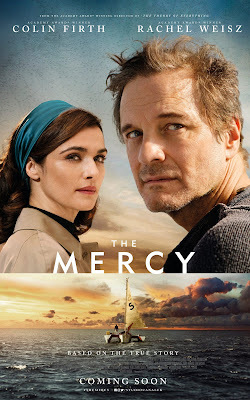 We haven't seen or heard anything on The Mercy in so long I forgot it was even coming out. The film, which stars Colin Firth as doomed yachtsman Donald Crowhurst, began shooting two years ago and was completed last year. It has always had the ingredients for a potential Oscar contender: harrowing true story of man vs. nature, a renowned director in James Marsh (Man on Wire, The Theory of Everything), a script by Scott Z. Burns (Contagion), and a co-star in Rachel Weisz. And yet its release is timed to hit as wide of any awards consideration as possible, which isn't a good sign. Fortunately, the first trailer has arrived and it looks pretty solid. Then again, I thought Firth's Railway Man would be an awards player, too, and that turned out to be the complete opposite. The Mercy tells the true story of Crowhurst, an amateur boater who lied his way into racing the around-the-world 1969 Sunday Times Golden Globe Race. Turns out the stories he told would be his ultimate undoing. Apparently there is expected to be a huge marketing campaign for this from StudioCanal, but I'll believe it when I see it. As of now it's due to hit the UK in February while the U.S. has no date set.